Like any other breed of dog, Poodles are prone to a number of canine health problems. Some of these health problems depend more on the variety of Poodle, while others can be found among all sizes. It’s important for Poodle owners to be aware of common health issues and problems as well as how to properly care for and prevent diseases for their pet. It’s wise to learn about the common health issues for any breed of dog before considering adopting one. For all Poodles (Standard, Miniature, and Toy) common health concerns include hip dysplasia, progressive retinal atrophy, epilepsy, Addison’s disease, thyroid issues, hypoglycemia, bloat, and collapsed trachea. Standard Poodles are also at a higher risk than other breeds for certain cancers, including insulinoma and hemangiosarcoma. Hip Dysplasia in dogs happens when a Poodle’s hip joint becomes weak or deteriorates. The condition is thought to be genetic and usually results when the hip socket doesn’t form correctly, causing it to become dislocated. While hip dysplasia is hereditary in Poodles, other factors can make the problem worse. An overweight dog will have more strain on their hips. Conversely, too much exercise over time can cause prolonged stress to the hip. A faster than average growth spurt can also contribute to hip dysplasia. Symptoms may show in Poodles as young as 5 months old, but they can be diagnosed with the condition at any age. The indications may be very subtle in the early stages of a dog’s life, and more prominent signs won’t appear until they grow older. Symptoms include weak limbs, difficulty getting up off the floor, hopping with both rear legs up, limping, taking small, hesitant steps, and unwillingness to exercise, play, or climb stairs. Epilepsy in dogs is a common condition known to affect Poodles. If a canine has epilepsy, they will exhibit a combination of symptoms which may include drooling, walking in place or pacing, unresponsiveness, confusion, stiff limbs, sudden unconsciousness, difficulty breathing, or other strange movements. In order to help a veterinarian diagnosis the severity of your Poodle’s epilepsy, make sure to take note of all the symptoms he has been showing and exactly what happened during the canine seizure. Progressive retinal atrophy in dogs is a serious eye disease that can lead to blindness. It affects retina of the eyes and always happens to both eyes at the same time. Early symptoms include dilated pupils, night vision problems, glassy eyes, bumping into furniture, or other signs of canine blindness. Although many studies have been conducted on the condition, there is no known cure. Some tests have shown hope for treatment with antioxidant supplementation. However, this will only slow the process with some dogs and cannot stop the blindness from occurring. Many dogs with progressive retinal atrophy can function well in a loving home environment, and since it comes on slowly, many dogs can cope effectively. Standard and Toy Poodles may experience other eye problems such as cataracts in dogs or glaucoma. If a Poodle is suffering from Addison’s disease, it means that their adrenal glands aren’t producing enough of the hormone cortisol. This can cause dogs to become lethargic, depressed, anxious, or experience digestive problems. Some Poodles may experience an acute crisis of Addison’s disease in dogs, which would require hospitalization. A common hormonal problem seen in Poodles is canine hypothyroidism, which arises from inadequate levels of thyroid hormones. Symptoms include hair loss, weight gain, weak immune system, excessive hunger, and seeking out warm spaces. Similar to other large, deep-chested breeds, Standard Poodles have an increased risk of bloat. Bloat in dogs is sometimes referred to as gastric dilatation volvulus, and can be potentially fatal when the stomach twists on itself, trapping air inside. Poodles that are bloating should get immediate veterinary attention and will usually have to undergo surgery to correct the problem. Puppies have a different set of health risks than full-grown Poodles. One of the most common health issues for Poodle puppies is hypoglycemia. All dog breeds of puppies are at risk for developing hypoglycemia, and when they do, it tends to come on very quickly. Toy and Miniature Poodles are also prone to getting hypoglycemia, but puppies will commonly develop the condition within 4 months of birth. Hypoglycemia occurs when there is a sudden drop in blood sugar levels and can be fatal for dogs. It typically surfaces as a result of stress or not eating enough food on a regular basis. Symptoms of hypoglycemia may include weakness, clumsiness, confusion, tripping or falling down, shaking, shivering, head tremors, or slowed breathing. If the condition is not treated promptly, a puppy will be at risk for slipping into a potentially fatal coma. It’s normal for Poodle puppies to be sleepy and to take naps during the day, so there is usually no need for worry if a puppy shows just one of the signs of hypoglycemia. However, if you suspect it is a more serious condition, it’s better to be safe than sorry and consult your veterinarian. 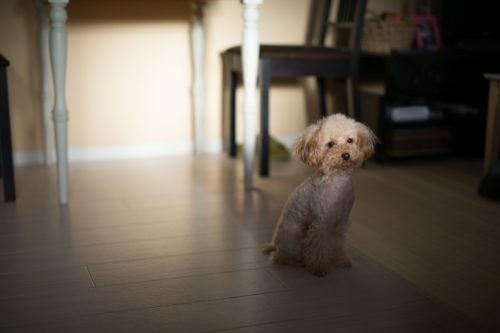 Toy and Miniature Poodles are at risk for several of the same health problems as other small breeds of dogs, luxating patellas, difficulty breathing from a collapsed trachea, and dental problems due to crowding in their small mouths. Toy Poodles may also suffer from Legg-Calvé-Perthes disease. This condition causes a reduced supply of blood to the thigh bone, resulting in degraded bone. The first and most common sign of the disease is canine limping, which appears with puppies between 4 and 6 months of age. Treatment requires surgery, which usually allows the dog to live a normal life aside from an increased risk of arthritis. Toy and Miniature Poodles can also be affected by a skin problem called sebaceous adenitis. This condition is caused by inflammation of the sebaceous glands and can lead to dog hair loss and skin infections. Sebaceous adenitis can be diagnosed with a skin biopsy. All breeds of dogs have the potential to suffer from genetic health problems, just as all humans have the potential to inherit certain diseases. 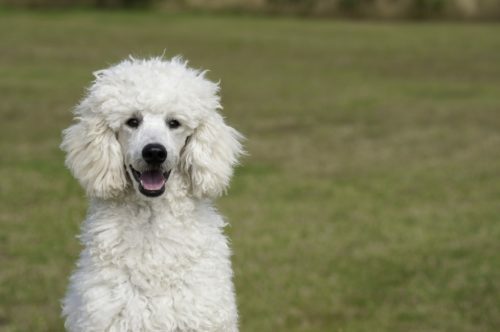 A reputable breeder will be honest and knowledgeable about common health problems of Poodles and be able to offer valuable advice for proper care. Not all health conditions are detectable in a growing Poodle. It can be difficult to predict whether your pet will live a healthy life free of these ailments, but a reputable breeder will be committed to breeding the healthiest dogs possible. Breeders should be able to provide certification showing that the parents and grandparents of a dog have been screened for various defects. All pets need food, water, and shelter in order to survive. However, for a dog to be able to live a happy and healthy life, they need much more. The type of food that your Poodle eats has a direct connection to his health. Providing your pet with quality food can prevent a wide range of health issues. Additionally, a healthy diet can help to extend your Poodle’s lifespan. Exercise is a vital component to a Poodle’s health. At least one walk per day is recommended to help large dogs maintain adequate muscle mass and keep their metabolism healthy. Many dog owners are unaware of the importance of proper dental care. Infections of the teeth and gums can cause serious issues for Poodles. It’s important for owners to brush their canine’s teeth daily in order to prevent gum disease in dogs and bacteria build-up. Mental health is just as important as physical health for Poodles. In order to live a happy, content life, they need a loving family that can provide attention and care. Proper canine socialization, playtime, and opportunities to relax with his family in a peaceful environment will decrease stress levels for your dog allowing him to live a better life. “Poodle Health Concerns.” All Poodle Info, Accessed 27 Oct. 2017. www.allpoodleinfo.com/poodle-health-problems. Coleman, Quentin. “Poodles & Eye Diseases.” The Nest, 21 Nov. 2017, Accessed 27 Oct. 2017. www.pets.thenest.com/poodles-eye-diseases-4954.html. “Poodle Health Issues – Standard, Miniature and Toy Poodle Health Problems.” Poodle Zone, Accessed 27 Oct. 2017. www.poodlezone.com/poodle-health-issues/. “Poodle Breed Information.” Vetstreet, Accessed 27 Oct. 2017. www.vetstreet.com/dogs/poodle. “Poodle (Standard).” Parkwood Animal Hospital , Accessed 27 Oct. 2017. www.parkwoodanimalhospital.com/client-resources/breed-info/poodle-standard/.